Green presidential candidate Yannick Jadot has called for his supporters to back Emmanuel Macron in the second round of the French election this Sunday (7 May). But the former banker’s “technocratic” vision of Europe is unconvincing, Jadot told EURACTIV France. 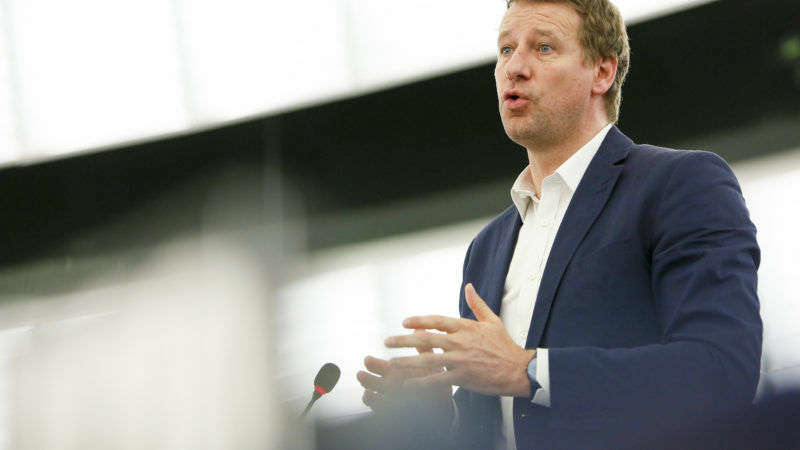 Yannick Jadot is a French Green MEP. He won the Green Party’s primary and was nominated their presidential candidate. He withdrew from the campaign to support Benoît Hamon. Jadot spoke to EURACTIV.fr’s Cécile Barbière. Benoît Hamon, whose campaign you joined, won just 6.3% of the vote in the first round. In what state does this leave the cooperation that you proposed between the Greens and the Socialists? It was a terribly disappointing score. But I still think it was a good campaign and it should serve as the starting point for a political reconciliation that will help us out of the current stalemate. We have to create a whole new entity because the members of the Socialist Party will never join the Green Party, and the ecologists will never join the Socialists. But this kind of score can not only be explained away by external factors. It is down to several things. Obviously, it did not help that half of the Socialist Party sabotaged the campaign and wanted Hamon to lose. Voters either fled to Emmanuel Macron or Jean-Luc Mélenchon. And in this campaign, once it was clear you were unable to reach the second round, there was no safety net. Benoît Hamon’s two million voters are real heroes. But again, external factors were not to blame for this score. We did not explain our programme well enough, particularly the question of the universal basic income. And voters perhaps didn’t realise that Hamon’s programme signalled a real split from the current presidency; as a Socialist, they saw him as François Hollande’s heir. You have called on your supporters to vote for Emmanuel Macron in the second round, to defeat the National Front, but you have not endorsed his programme. We should remember that the nuclear reactor of the extreme-right is the radicalisation of society. It is not national preference, it is ethnic preference. The people who say that Emmanuel Macron stands for the bankers and the National Front (NF) for racism and that they refuse to choose between the two, they are rarely people who suffer greatly from discrimination. Making this kind of comparison between liberalism and fascism is profoundly irresponsible. The programme of the extreme-right is unlike any other. With Macron, the political game will take place inside the democratic arena. With Marine Le Pen, there is real doubt. Macron and Le Pen are like Trump and Clinton. One is the candidate of the “insiders” and the other is the candidate of the “outsiders”. The campaign can swing at any moment. But Jean-Luc Mélenchon is cultivating this confusion. I regret the fact that a political movement whose leaders have never previously indulged in this confusion should do so now, and fail to differentiate between a political stance that can be contested within the democratic space and one that would step outside it altogether. Mélenchon brought young people into politics who were not interested before. He has the responsibility to teach them about this. The discourse that Le Pen and Macron are two of a kind is appalling. Beyond the need to block the National Front, what do you really think of Macron’s programme? He is offering a continuation of the current presidency. He says he wants to make France an avant-guard country but concretely, his ecological programme stops at the point where the lobbies’ interests begin. If he is elected, he will be the least-supported president of the 5th Republic. In the first round, his real supporters only numbered 13% but he got through to the second round as the candidate who can stop the NF. Can he really consider that he was elected on the strength of his programme? I expect to see huge progress, particularly on the ecological transition, the end of nuclear energy, the reduction of pesticide use, the end of diesel. I hope he will be a lot more serious than when he was in the government and during his campaign. On this subject, Macron recently said he would establish a scientific expert committee to evaluate the consequences of the EU’s free trade agreement with Canada, CETA. Is this evidence that he is opening up his European policy? It shows that he has understood. At first, he didn’t even want to raise the subject with his own team. This kind of deal contributes to the loss of democratic sovereignty because it creates competition between regions and workers. And instead of fostering openness, it leads to closure. The principle of liberal politics is to say that the liberal economy produces democracy. But what we really see is the opposite. Liberal globalisation, far from producing greater protection, leads to illiberal democracy, the rolling back of rights rather than the creation of new ones. Some pro-Europeans support CETA and TTIP and say that Europe suffers from communication problems, not structural political problems. If we pro-Europeans do not manage to find a space in which to make this liberal Europe evolve, we will see more Brexits and more nationalist victories. So you see the split among pro-Europeans as being along this front between free trade and liberalism? Yes, over questions of liberalism and austerity. I am not saying there is no problem with deficits but austerity has become an economic dogma. We could almost believe that 2008 was a crisis of public finances and not one of the liberal economy and deregulation. Now they tell us that it is a problem of the numbers of civil servants, not market regulation. So do you see a possibility for reconciliation with Emmanuel Macron around the European project? As things stand, no. Macron is pro-European in the same way the Jean-Claude Juncker or José Manuel Barroso said they were pro-European. But today, he is the candidate of the European status quo. He has a technocratic vision of Europe. Today, the main challenge for Europe is to create large numbers of jobs and to bring back some direction to the energy transition. Those who are disenchanted hate Europe. But how is today’s France any more satisfactory as a democratic space than Europe? But Europeans are so disenchanted that they might well choose the leap into the unknown above the status quo. Ecology has occupied a relatively modest place in the campaign. What do you think of Macron’s engagement on the subject? Ecology has never been more present in a presidential campaign. Two candidates even made it the central pillar of their campaigns: Mélenchon and Hamon. But this whole election has been so badly polluted, first by scandals, then by tactical voting, that the important debates have been disappointing. At a European level, the reactions to the first round of the presidential election have been rather optimistic. Isn’t this a sign of a dangerous denial of the real situation? Imagine if the AfD were to win 40% in Germany, the whole world would be terrified. Le Pen is able to assemble 40% of voters in an election where turnout will be around 80%. We might say we are relieved but Le Pen is edging closer to power. Relief is not enough. In all European countries, society is being polarised: the debate is no longer one between left and right. Europe has the responsibility to drag us out of this situation. Wrong ! Le Pen is like George Lincoln Rockwell . It is Emmanuel Macron who (like all left wing extremists) wants to destroy white ethnic homogeneity and promote the spread of Islam through mass immigration so if anybody stands for racism and is a supporter of religious fanaticism it is Macron. You’re very simplistic but don’t don’t mention that MLP wants in reality destroy France’s economy and further rise jobless by her irrealistic economical facho ideology . The economy is not about fanaticism nor does Macron support any kind of right or other Fanaticism that does harm the welfare of French citizens . The Point is the public deficit actually and the terrorism but not the religious points .